As an 80’s kid, my earliest board game memories are of Milton Bradley games. Or more accurately, Milton Bradley commercials. You could explain the entire rulebook in thirty seconds, like in this little humdinger of advertising finery. The games were simple, and, once you reached the age of 10, simply boring. But like Pasta Night or Taco Tuesday, they still hold their place as comfort food for your board game shelf. The Game of 49 is a perfectly serviceable little modern entry into this genre. It’s fun … and it’s meh. 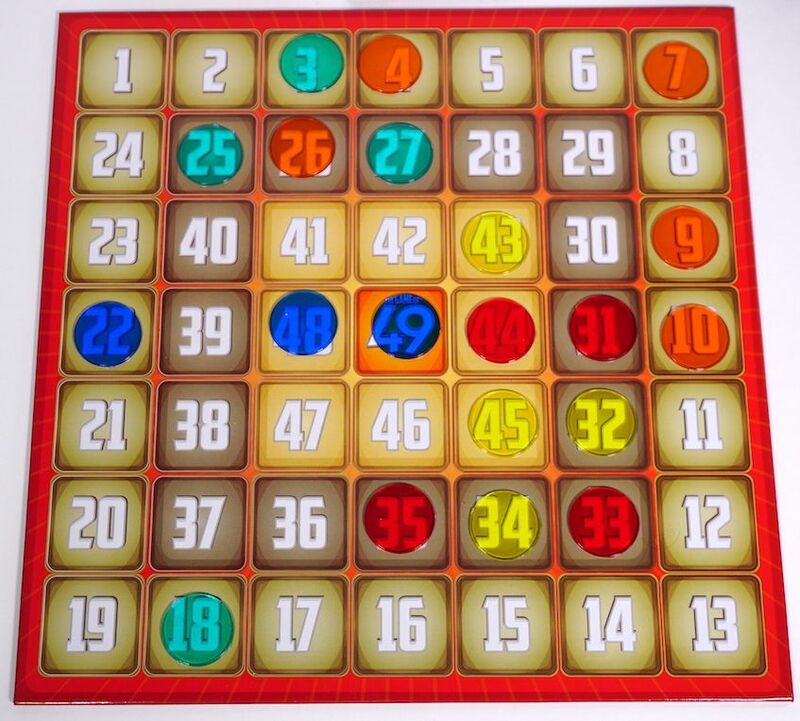 The Game of 49 can be described very simply as Connect Four, but with bidding. Each turn you flip over the top card on the deck, revealing the next space (of 49 spaces, natch) on the gameboard up for auction. Players bid in a standard format until everyone but one player passes. The winner pays the amount of their final bid to the bank, and places their chip on the space. Claim four in a row, and you win the game. A few cards specify a group of spaces rather than just one. Win this auction, and you get your choice (as long as it was not previously claimed). These cards also trigger the only income gathering mechanic: $7 for each chip you already have on the board, up to a maximum of $49. Annnnnnddd… that’s all there is to it. While the amount of money everyone has is technically a secret, it’s not too hard to have a good idea of who’s got a lot and who doesn’t. Everyone’s progression toward victory is plainly apparent on the board. Once you have three in a row, everyone knows which space you are going for. Victory is always clinched by a player having more money than every other player, so that they can outbid everyone for that last needed space. Since it takes 2 minutes to explain and 30 minutes to play, you’d expect The Game of 49 would have good replay value. But there’s not much to bring you back to the table. There’s some light strategy, sure. You might try to diversify by spending small amounts on spaces all around the board, looking for an opening. Or you can hoard your cash and wait it out for your winning numbers. The income mechanic encourages players to buy at least a few spaces early so that they get more money total over the course of the game. But the game always seems to devolve into the same slog of end game where you play out the string waiting for the player with the insurmountable money lead to finally have his or her winning number come up for bid. It’s unfortunate, because I feel like the solution to this repetitive outcome is hinted at in the game’s own marketing materials. The tag line on the box says “Chips in a row, money under the table, game on the line.” Now what that middle phrase refers to is only the fact that how much money you have is a secret. But what if you could actually transfer money to another player? The players in third and fourth place might be able to play the leaders against each other, letting them escalate their bidding wars while quietly buying up a few spaces on the other side of the board and vaulting themselves back into contention. Or what if successfully blocking a player’s line of two allowed you to steal some of their cash, or flip one of their spaces to you, Othello-style? I’m not saying any of these suggestions would actually work – good game design is hard, folks. But I offer them as illustrations of what’s missing: a compelling reason to play this game again. The rules specify that The Game of 49 is for ages 10 and up, and that felt about right. Kids will need good counting and budgeting skills to play effectively. The quick playtime and simple rules are also helpful for those with short attention spans. 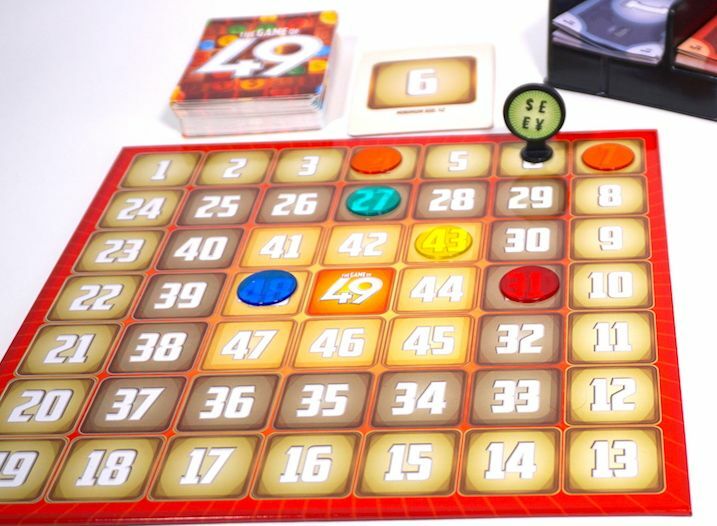 In the end, what designer Mark Corsey and publisher Breaking Games have delivered is the Cookies & Cream flavor board game – safe, generic, and formulaic. It’s the game you pull off the shelf because you can’t agree on anything better. Had it included a compelling mechanic – sanctioned player collusion, chip trading, or a way to steal another player’s money – this game might have been a real keeper. You’ll certainly enjoy it for a time or two. If you’re a fan of the Milton Bradley classics, or in need of a light dinner party game for guests who aren’t into Euro games, this might fit the bill. But The Game of 49’s most likely destination is your “To Be Traded” pile. You can order your own copy of The Game of 49 here. 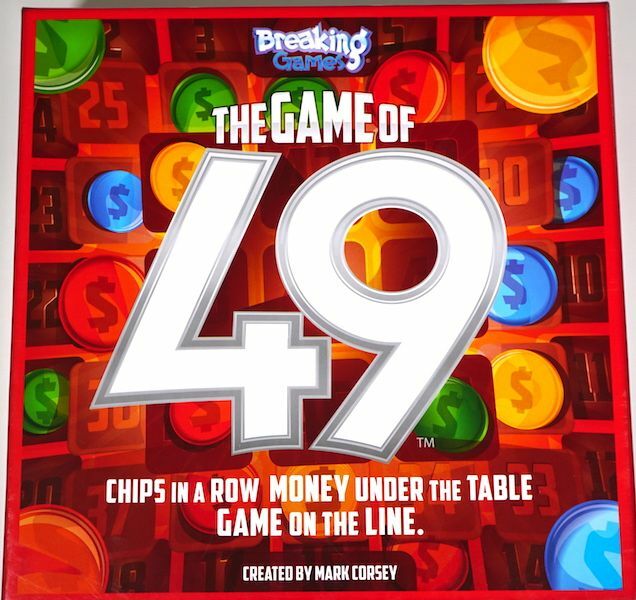 The Family Gamers received a review copy of The Game of 49 from Mark Corsey.